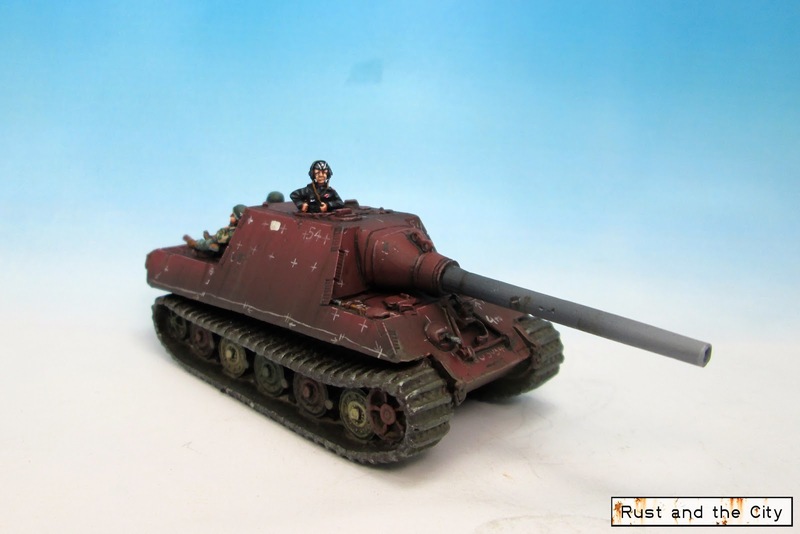 This model was the final Jagdtiger finished in the set of five. 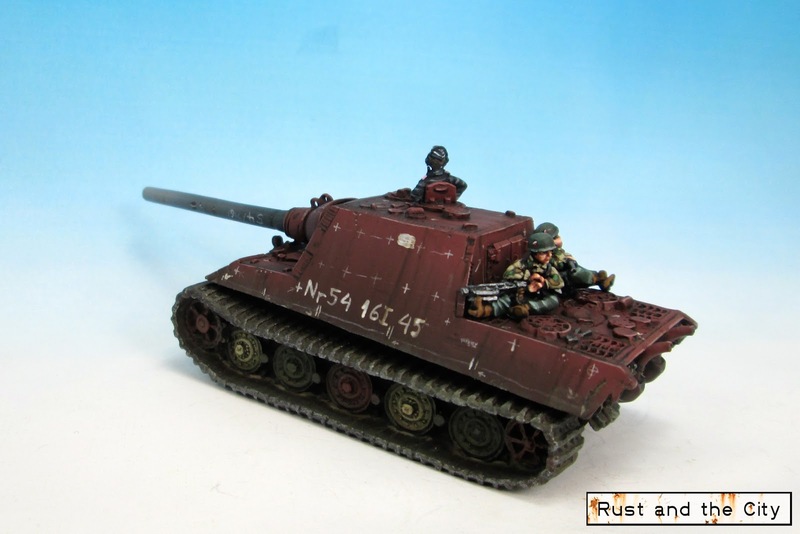 I previously posted the green Jagdtigers and the Winter Jagdtigers. 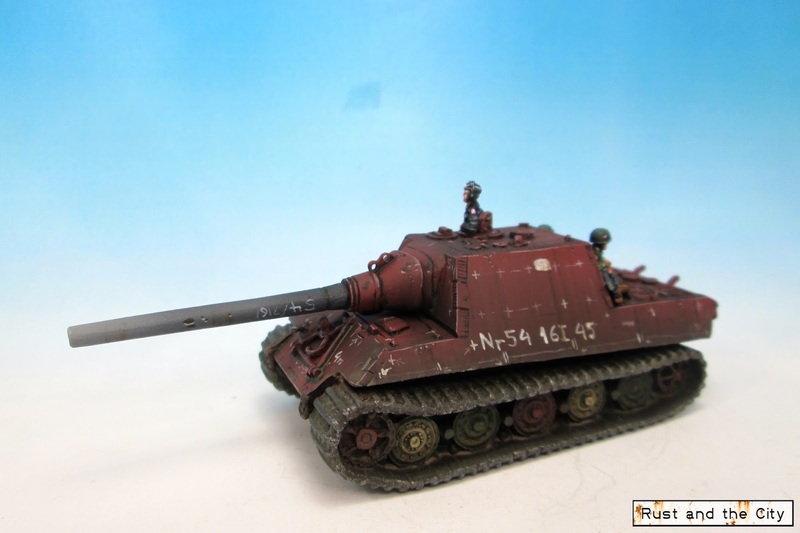 This model is the command tank for the company. 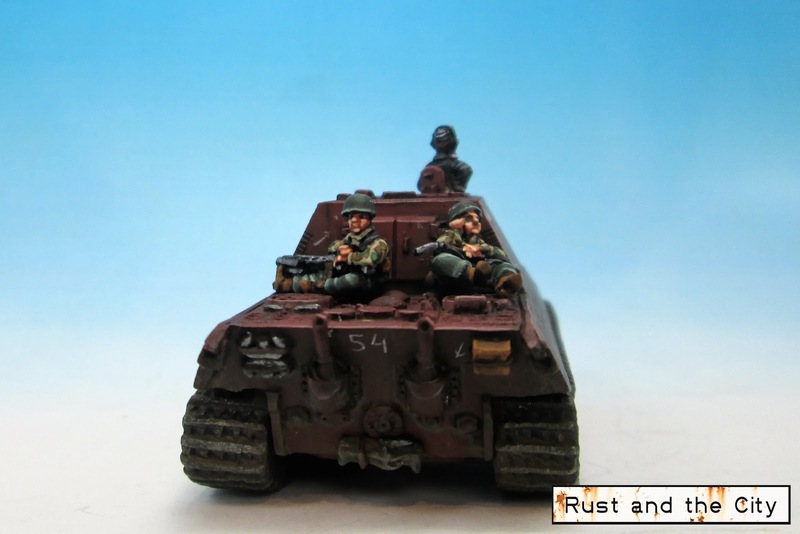 On the back I added two Fallschirmjager tank riders from the King Tiger box. 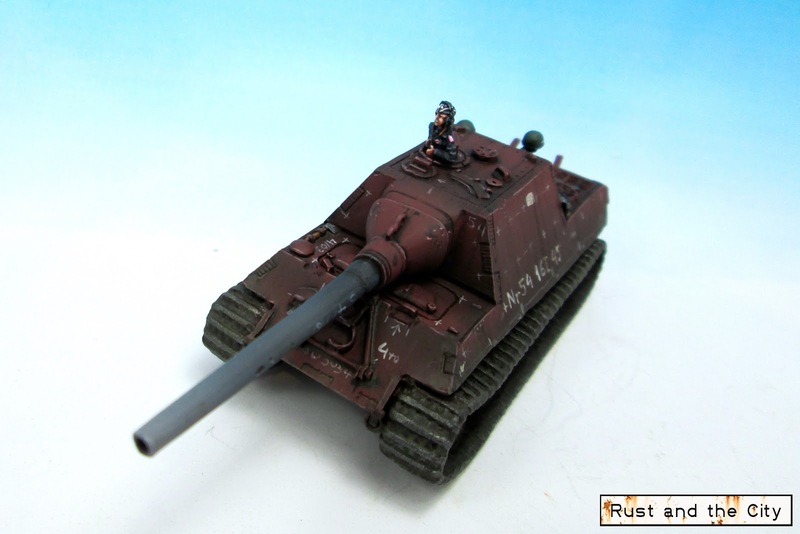 This model is part of a commission for the same client as the Winter King Tiger and Desperate King Tiger I posted a few months ago. In total, he will have a pretty formidable company of big cats! I experimented with using a dremel to remove details from the hull. I used a round sanding bit to quickly remove the tools and track link holders from the side of the resin model. The dremel made quick work of removing the details. The challenging part was controlling the dremel. I may try to find some very high grit dremel sanders to allow for more precise work. It was quite liberating to make such large changes on a model. This model was a lot of fun to paint. It was fun to work on the red oxide modulation on the large side panels of the model. It was a challenge to add depth to the colour without making the model too pink. 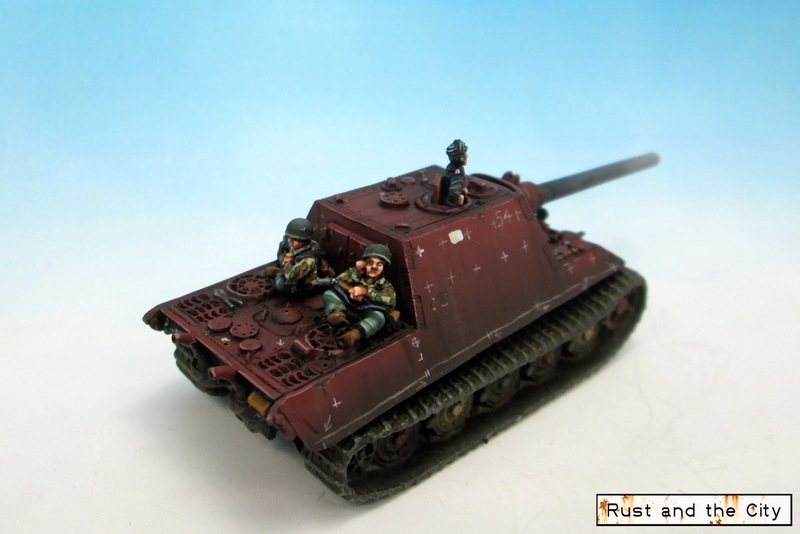 I'd be interested to try some of the various sets for modulating Red Oxide Primer but don't want to invest the cost of the paint set in something I do so infrequently. For this model I used Vallejo Model Air Hull Red, Mahogany, and Sand mixed with Mahogany. I know that this model will not be to everyone's taste. It was fun to paint and was really neat to try some more detail work. 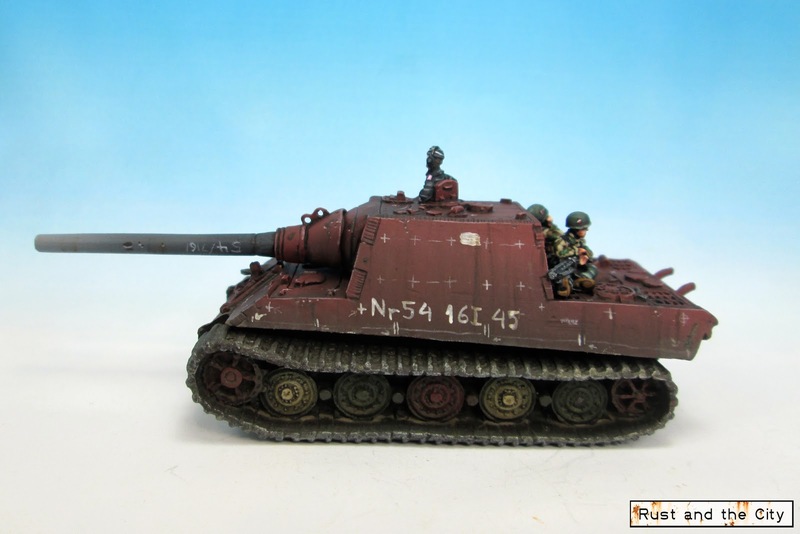 I hope you've enjoyed this series of Jagdtigers. I'm making progress on my panzergrenadiers and will hopefully have them finished two weeks (ahhh!!!) from now. Which Jagdtiger do you like the best? Let me know what you think in the comments. Thanks for visiting. Thanks Dave. Good to see you around again. Haha. Thanks Stephen. Glad you like it. Fantastic. I love the love the chalk markings.....looks straight out of a factory. The shading on the red truly is fantastic. Thanks! I was a bit nervous while I was painting it to see how the final model would look. They are all good but the last one really shows the last desperate days of the war . Tanks beinging driven straight out the factory to the front and the training grounds now are the front line . Sorry got carried away but that's what a well researched and completed work can do . Thanks furphy. I like models like this that tell a story. This is wonderful, I don't play WW2 games but the quality and finish is excellent on this. Thanks Dave. WW2 models are surprisingly fun to paint. That's a lovely paint job. I do like the modulation. It is very well done...and you just taught me a history lesson to boot! Thanks Greg. I really like adding modulation to models. Very nice, your posts really make me want to start painting these models as well. But, I've got enough different things to paint as it is. So I guess I will just keep checking in on your work. Thanks. You should give some a try. I've really enjoyed painting 15mm models. Thanks. I know how you like the bug cats :-). I'm looking forward to seeing your Jagdtiger. This is by far my most favourite of the group. You've done a brilliant job, from the obvious wonderful paint job, through to the fact that you spent careful time and effort to remove the sculpted details on the model (An untrained eye would never have figured). Did these unpainted types feature in multiples? Would love to have 2 or 3 in the same scheme for my own collection, but only if it would be termed as "historical". Thanks Dai. I have no idea about the historical use of jagdtigers in this pattern in the field. I'm guessing google images might be the best chance of finding out. When I researched I didn't find any historical pictures of this pattern. 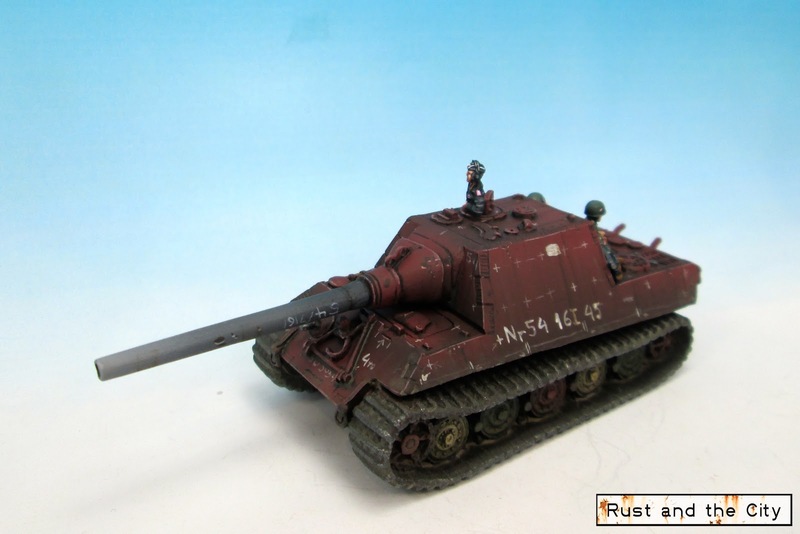 I just found pictures of other models. Has anyone ever noted that you have a fairly decent attention to detail? Haha. Thanks drax. I have heard that with my models but not really in any other area of life. Cool, thanks for the link. I'll definitely use some of those pictures for inspiration if I do any more. Excellent looking JT! But what did you use to make all the markings? Paint? 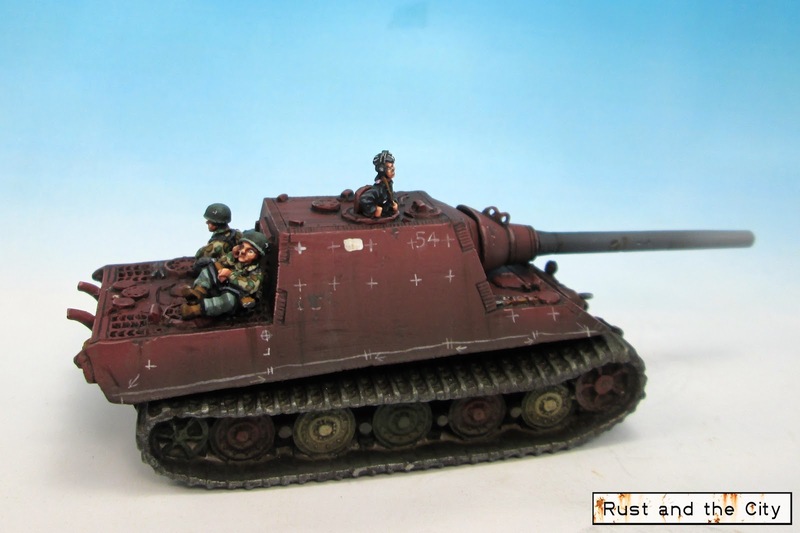 Just curious as I'd need to do ones myself to an objective Jagdtiger. Where did you get your information on the chalk markings? I'd like to do something similar but want to make sure my chalk markings are right.